For doctors that have completed the Council on Extremity Adjusting's (CEA) course on Foot, Gait and Orthotics module. This form will enable CCEP's to correctly examine the foot for making or prescribing foot orthoses. Send this letter in with your claim forms for orthotics. Be sure to format to accommodate your company's logo and address. Designed for doctors trained in Extremities Adjusting, this form is perfect for graduates of the CCEP program. 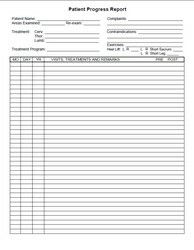 Keep all of your patient notes handy for reference with this patient progress report. A very handy piece of furniture for examining the feet and storing orthotics. This station will enable the skilled CCEP to quickly and efficiently make custom orthotics for their patients on the spot! Avoid repetitive orthopedic testing/challenging of ligaments of the knee during the healing process until near the end of the healing period. Allow the new filaments of the ligaments to reattach with out you disrupting them constantly.